Death, taxes, and Tim Duncan. 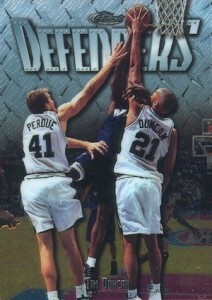 While other established star players in the NBA from his era dropped like flies, Duncan continued to produce. The double-double machine has finally seen his collecting interest rise and at the age of 40, Duncan elected to retire from the league after playing his entire career with the San Antonio Spurs. 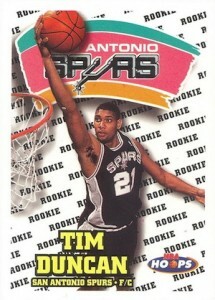 Collectors have plenty of Tim Duncan rookie cards to collect and all 18 are documented below. 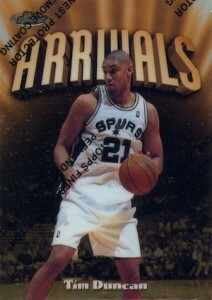 Shop for Tim Duncan rookie cards on eBay. Unlike the many high-end products of today, when Tim Duncan entered the league, the collecting landscape was much more simple. Therefore, all of his rookie cards are very affordable and only the high-grades command significant prices. 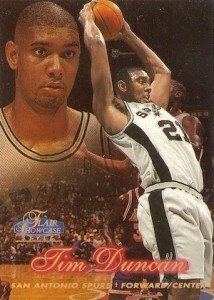 However, there is still plenty of value to be found in 1997-98 Tim Duncan cards and that deals directly with the many parallels for his rookie cards. Those are noted below when available. In addition to the official Tim Duncan rookie cards, collectors can also check out his early Collector's Edge, Score Board, Wheels and Press Pass cards, which all offer autographed cards. 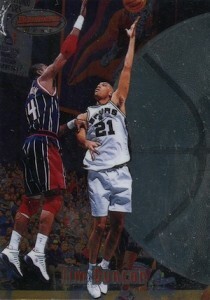 For a complete collecting look, view our Tim Duncan profile. 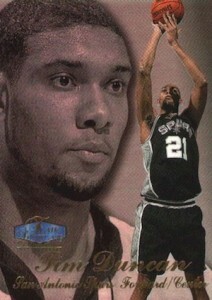 Not just limited to his earliest cards, check out notable cards across his career in the list of the Top Ten Tim Duncan basketball cards. 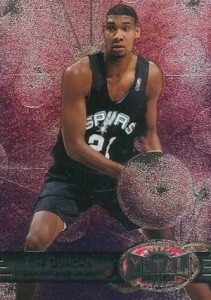 With a large silver ball design dominating the background of the Bowman's Best rookie card, it is easy to miss Tim Duncan battling his Hall of Fame counterpart, Hakeem Olajuwon. Like many of the Duncan rookie cards, the parallels produce the highest values, including Refractors and Atomic Refractors. 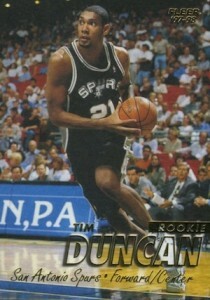 One of the most inexpensive Tim Duncan rookie card options, 1997-98 Collector's Choice keeps things simple with an image of Duncan working the post. A popular design for collectors, 1997-98 E-X2001 takes acetate and foil and makes it work very well. 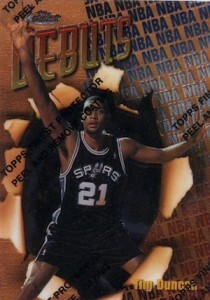 Rare Credentials Future (#/6) and Credentials Now (#/75) parallels bring this Tim Duncan rookie card to another level. 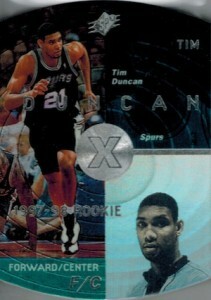 Although the design is a little cluttered, especially the base "Debuts" rookie card, 1997-98 Finest remains one of the top Tim Duncan rookie card options. 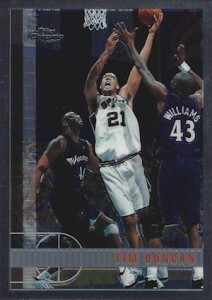 Duncan has three cards in the primary set and they are broken down by tiers — Bronze, Silver and Gold. A variety of parallels, including Embossed, Refractors and Embossed Refractors, present even more choices. Another product with multiple Tim Duncan options in the main set, 1997-98 Flair Showcase ups the ante with four different options. Starting with Row 3 and working down to Row 0 (#/250), all four cards are shown below and the individual rarity increases as the Row decreases. Each of the four cards also have a limited Legacy Collection parallel that is numbered to 100. 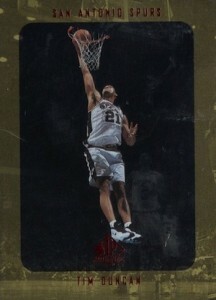 1997-98 Fleer gets back to basics with a very simple design consisting of just gold foil text and an action image of Tim Duncan. Crystal and Tiffany Collection parallels add rarity and a change in the foil color. 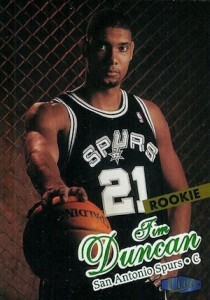 Anything but subtle, the Tim Duncan rookie card in 1997-98 Hoops may be the most obnoxious of the group. However, it does offer another budget rookie option. 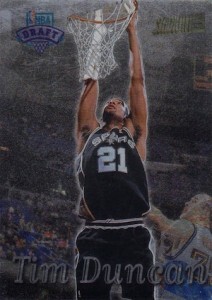 Metal Universe opts for a more abstract Tim Duncan rookie card, composed of foil and a pink background with a celestial feel. The 1997-98 Metal Universe set is also home to the heavily-collected Precious Metal Gems (#/100) parallel which can produce some big values. A separate Metal Universe release with a clearer background and updated text design, Championship also features a Tim Duncan rookie with a Precious Metal Gems (#/50) parallel. 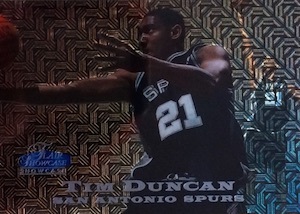 The 1997-98 Skybox Premium design makes Tim Duncan the primary focus with a blurred background and is accented with gold foil. The Star Rubies parallel is numbered to 50 and features a wild, Refractor-like finish and red foil. The first basketball edition of SP Authentic is likely the most unrecognizable for collectors given the dark background and light border. 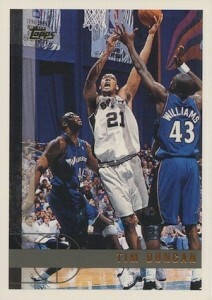 This Tim Duncan rookie is very condition sensitive. 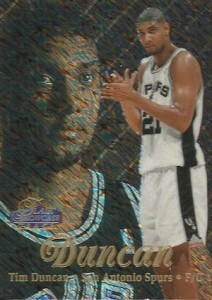 A die-cut design and hologram technology makes 1997-98 SPx one of the most distinct Tim Duncan rookie card options. There are also Bronze and Gold parallels available. 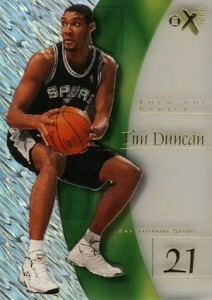 Differing from the base veteran design, the Tim Duncan rookie in 1997-98 Stadium Club has a more foil-like appearance. First Day Issue (#/200) and One of a Kind (#/150) parallels present a tougher chase. A nice base alternative if you are looking for a budget Tim Duncan rookie card, base Topps features the same design as his popular Chrome rookie card. Minted in Springfield parallels add the Basketball Hall of Fame logo in bronze. While they are available for everyone in the set, this is still a cool element considering his guaranteed spot in the Hall of Fame. 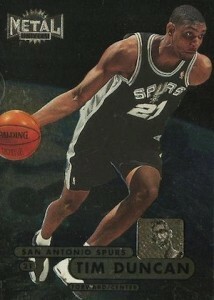 The clear favorite among Tim Duncan rookie cards, 1997-98 Topps Chrome applies a chromium finish to the base Topps design. 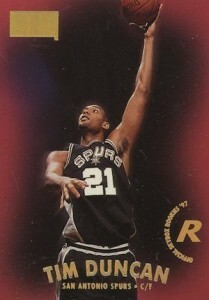 Refractor parallels remain some of the most popular Tim Duncan cards of all-time. 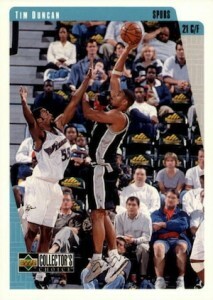 The posed image with a fence in the background gives this 1997-98 Ultra Tim Duncan rookie a unique look. These cards are very prone to chipping and the Gold Medallion and Platinum Medallion (#/100) parallels bring additional rarity. 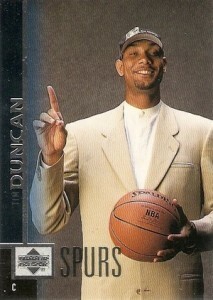 Showcasing a more relaxed Tim Duncan at the 1997 NBA Draft, the 1997-98 Upper Deck release has a refined design that goes well with the Duncan's suit. 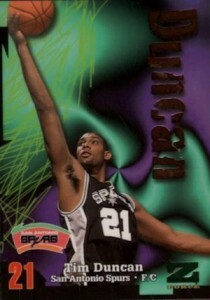 Giving Hoops a run for the loudest Tim Duncan rookie card design, 1997-98 Z-Force is mash of color and lines. Rave (#/399) and Super Rave (#/50) parallels bring strong values to this inexpensive rookie card.